Tim was the same before he started his UP body transformation. The financial journalist was the classic yo-yo dieter. Going on a health push, losing weight, getting in better shape, then letting is slip and piling it all back on, and more. 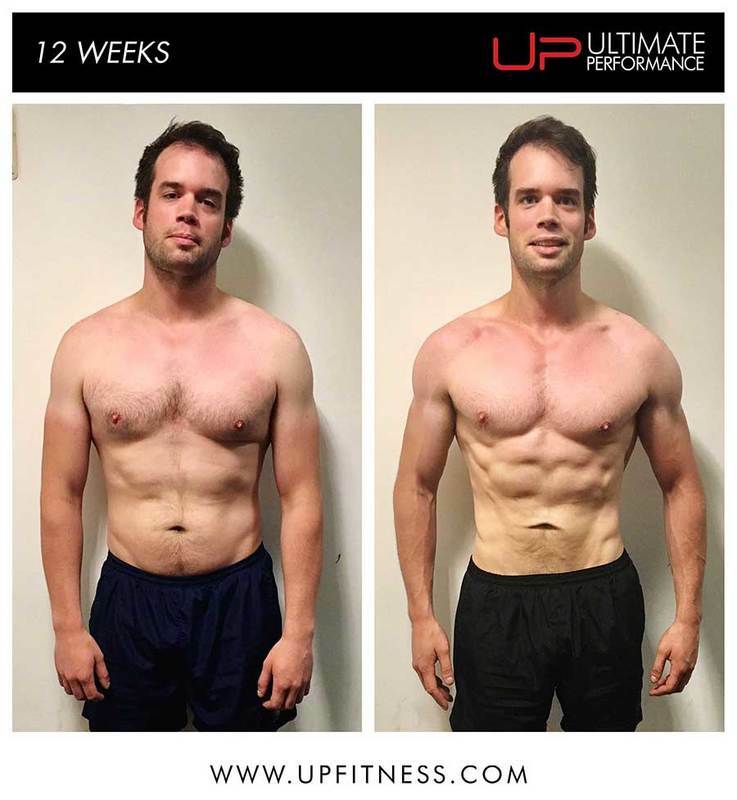 But his 12-week transformation has changed all that. 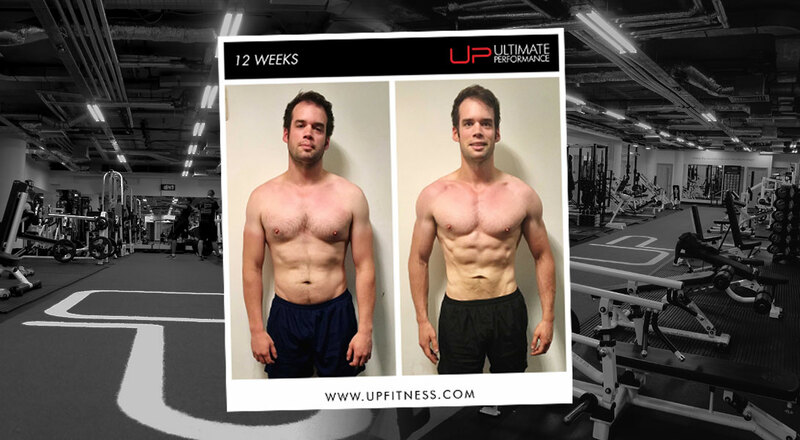 Tim's bespoke diet and training plan at UP saw body fat melt off him - in a matter of two weeks he had already shed almost 7kg. 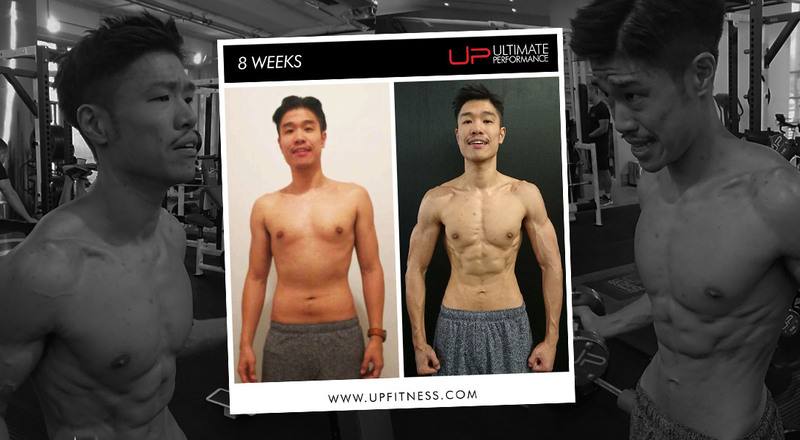 His weight dropped by 14.4kg and his body fat went from 17% to a superlean 9% in a matter of 12 weeks to get him in the best shape of his life. 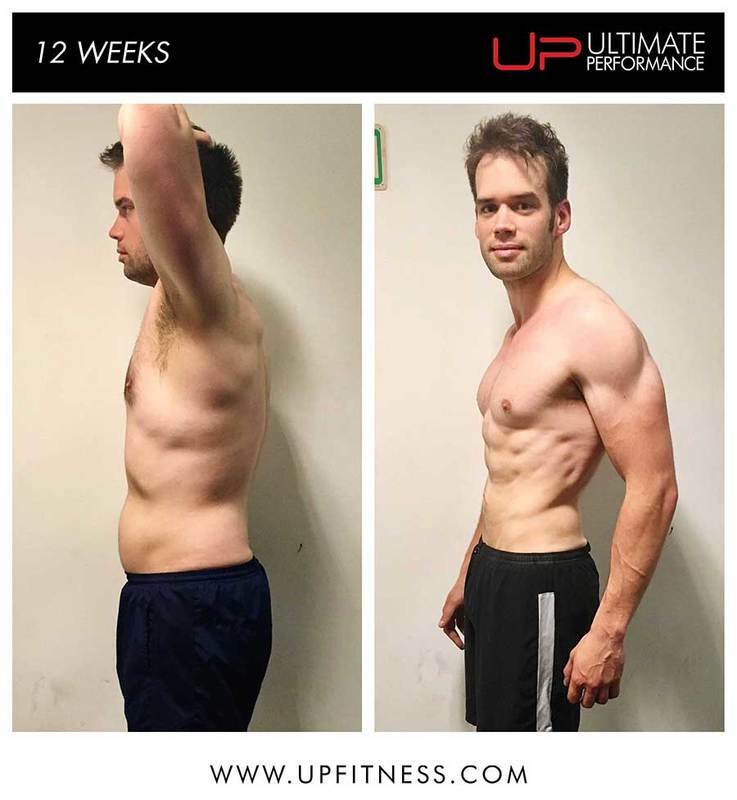 Tim says the best part of his transformation was seeing the results coming every week, seeing his strength go up an his body fat going down consistently. "I've not had one week where I've looked and thought I've gone backwards. Every single week I've had progress and that has kept me motivated for the following week." "I feel clean, I feel healthier and my skins better. I sleep better. It's indisputably made me a hell of a lot healthier. "I'm eating more greens than I've ever done in my whole life. I'm steaming plenty of broccoli and I'll now continue to do that. It took me until my thirties, but I'm finally eating a lot of greens." 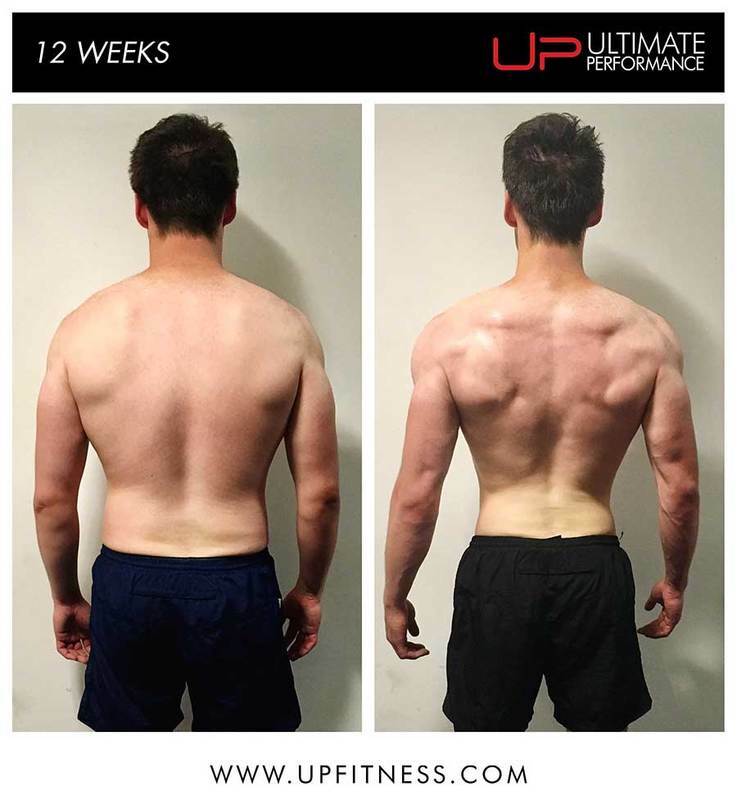 What made you take on a 12 week transformation? A mutual friend that I met had done it. I saw her eating some chicken and veg and asked her 'why are you eating chicken and veg and I know that means it's something to do with the gym?'. I'd trained hard but I'd let myself have a few too many cheat days, probably not worked out at the correct technique, always thought that I knew what I was doing but never really had the results to show for it because I always hit a plateau. Then I'd yo-yo and put on a bit more weight and never get down to a sculptured physique really. I started training when I was about 14 so I was 6ft when I was 14 so I'd go to the gym, lift some weights. With regards to my diet I did eat well but then the weekend would come along and I would eat a lot of pizza, a lot of starchy breads, loads of beer. I've got a huge soft spot for wine and then you'd get to Monday and you'd be back to where you were the previous Monday, or even a little worse off. Then when I'd go through period of not working out, then all of that would be out the window and I'd have put on five, six, 10 or 20kg. So I knew that with this 12-week period I was going to commit absolutely fully. Everything. Matt, my trainer, taught me how to train properly. From just your form that you think is correct, it probably is not as accurate as it should be. With the diet, the food that I thought was right was not quite right, so I ate a huge amount of greens and proteins and I've restricted my carbs till after working out. That means that carbs are only used to feed the muscles after a workout. Things like that I didn't really know, so I'd be having lots of porridge, lots of bread, all foods that get stored as fat so you'd hit a plateau much easier. I'm trying to take away a proper lifetime of knowledge with me. But the whole thing now when I'm done with my 12 weeks is to be able to maintain it. Once I've worked so hard to get there, I don't just want to give it up like I have done in the past. Yeah. One, because I know how hard I've worked and I don't want to give up. Before, I knew if I had a treat on Friday, I've worked hard for five days, fine. Now I've worked really hard - I'm eight weeks in and I've worked really hard for a long sustained period of time. I don't want to give that back easily. Equally, I've got results quite quickly. So I know if I follow this you can get results so why do something else? Why have four treat nights a week when you know it's going to have poor results. There's a shock element because you're going to do something that your body hasn't seen or experienced before. So simply stripping out the amount of carbs that you're having while working out with perfect form means within a couple of weeks you see significant changes. Then there's continual change. Do you take your measurements once a week and if you can see changes in that week it keeps you motivated. Before, I'd go to the gym and I'd be a kilo heavier or a little bit fatter or whatever, then that demotivates you. If you know that one more week has gone and you're seeing more results, you know there's one week less that you have to get exactly where you want to be. So that just keeps you motivated completely. What's the training like? How does it compare to anything that you've done before? It's no more hours than I've done before. I was probably in the gym more before, but it's the quality of the time in the gym. So the form is perfect now. Every single time you lift, you're isolating the exact muscle you want to work. To explain that, in other gyms that I have been to, you might have done a bench press but you've actually been using your shoulders a bit too much. Here if you're doing a bench press, you're just going to use your chest. Then you're going to push that muscle to failure. That's probably five times as good as what you may think your form was previously like. So you know that in that hour, your form is going to be perfect. Separately, the nutrition - pre-workout, post workout, and then during the day, your nutrition is perfect. So your body's continually taking on all the foods that it needs to. So although you're in the gym, for me three times a week at UP, I'm genuinely working 24 hours a day. Because you're putting all the fuel in that you need to keep cutting. Yes, it's not a load of 'meatheads'. You can tell from people here that they are serious and they are trying to get the results. But it's a pleasant place to me. It's fairly intense but without being overbearing. You know you're going to work hard for your hour but it's absolutely fine. What's been the toughest part of it then that you've found so far? That would be the diet. What I learnt is it's not to do with the calories that alcohol has, it's the effect it has on your body. It stops you from burning fat or gaining muscle. If you're doing this for 12 weeks you really need to give it your all, for me I had to give up the alcohol for 12 weeks. I like a drink on a Friday, socialising etc as much as anyone. So giving that up is tough, I have a soft spot for bread and pizza etc. So the diet's been quite hard. But I've managed to persuade all my mates to stop giving me loads of stick and they can see the changes so they know. I've had personal training before. I've had some good personal trainers before but I've mainly just got to a plateau where I've felt I needed to move on to a different level and here I have. I think there some very good personal trainers in plenty of other gyms but here is your Champions League type and you know when your entering its Champion League type territory. So if your trainer says to you we're not messing you around, here's the before and afters, listen to what I have to say, eat what I tell you to, work out the way I tell you to, then do it and take the formula and you'll see the changes - everyone will see as good a changes as the next person but, by and large, you know you're going to get results. It's down to you to just follow a fairly strict nutrition and don't skip the gym, don't say 'I can only do one this week' and try and fit in four next week. Stick regularly to three sessions a week. What's been the most enjoyable part so far in your journey? It's the results. It's seeing the regular progress. I've not had one week where I've looked and thought I've gone backwards. Every single week I've had progress and that has kept me motivated for the following week. Whenever I've felt a little weak when it comes to the nutrition, I have been able to think 'no, your making good progress. Don't throw it away, have some nuts, have some steamed broccoli, just keep to it'. Because you're making progress, you've got a weigh-in in two days time, and then when you have that weigh-in or measurements they come out better again. My strength has gone up. They've all gone in the right direction. So the fat came down, from about 15 and a half percent to under 10 percent. Then the shape has come on, so my trainer has tried to build up the shoulders and chest and I'm getting stronger. My trainer, Matt, takes a note of what I'm lifting each time so he can see whether I'm setting new PBs and from that we can see the progress I'm making. There's a time when I'm lifting heavier weight than I was last time I did that exercise. What are the biggest lessons that you've learnt so far whether it's about training or is it going to stand you in good stead? The biggest thing would be the nutrition. What to eat and when, what you can't eat, why you can't eat it and the education part is massive for me. Although, yes, there is this formula, you'd like to know why you can't eat a certain food or why you don't eat certain a foods. Also, you learn that there is a huge variety of foods, far bigger than I understood, that are absolutely fine to eat. What to do when you're at a restaurant and then in the terms of working out; when I'm working out on my own again I've learnt form. I've had such bad form in the past, but now I have perfect form. So I know that when I do my exercises, they're going to be very beneficial and I'm not going to be wasting my time. The most powerful thing that I found was I was training for 10 years and I'd never trained my chest and had never been able to feel a muscle working; now I know that's how it works, how you contract a muscle. My lats; I couldn't feel them working. My trainer told me they were there and it was only five weeks in that I felt them. I hadn't engaged them, ever. Now I'm a fairly big guy and your lats are fairly big muscles and I'd never felt them. So I don't know what I was doing on my lat pulldowns for 17 years, but it obviously wasn't the right thing. I'm a lot fitter, my physique is more the way I want it. But it's been more of an experiment for me rather than a vanity project. I wanted to see how far I could push my body. I know that in 7 or 8 weeks I've pushed it to a great space with four weeks to go! Take it week by week and you'll see results. And those results will be in the right direction and that will keep you motivated. If you were to come in and your results are not quite what you wanted, you will know. Even if you don't tell your trainer you will know it was that curry on Wednesday. It was that big night out and you're not saying. If you follow the formula, you follow the plan that's set out for you, you'll get results. Are you happy with the results you've achieved so far? I'm very happy with my results I'm very happy with my trainer. I expected the results when I came in here, as it is the best. UP calls itself the best, so yes, I expected the results and I'm very happy with how the results are going. 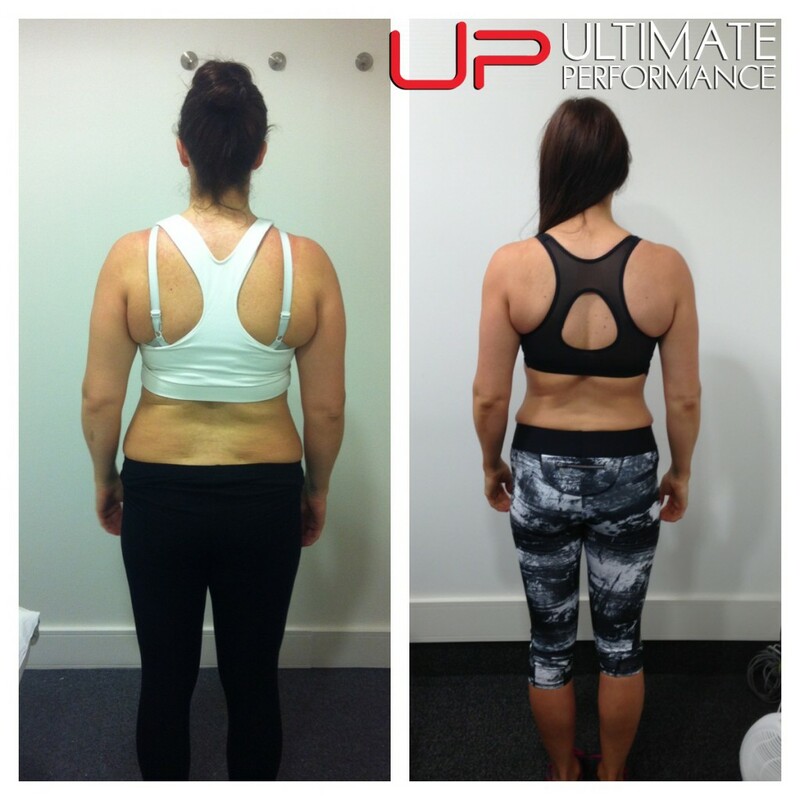 If you have been to a gym before and you know your way around a gym but you've just hit a plateau and you always hit a plateau and you just want to get the results you know you're capable of and you want to do it, go to UP. It takes three months. No longer. So yeah I would. I will probably add a bit of size with Matt when I'm done with this one. I want to keep at it and see where we can take it. It's an experiment. It's much more an experiment than a vanity project. I'm fascinated where you can take your body. Push it as hard as you can. If you're ready to get take control of your diet and finally make that body transformation that's always eluded you, BOOK A CONSULT NOW!